Sky burial site Tibetans believe that the cessation of breathing is only the first stage of death. Afterwards, they believe, the soul separates out of the various ‘subtle elements.” First, the earth elements dissolve into the water elements. As this happens the dead loses his sense of sight and feels like he is shriveling up. As the water elements dissolve into the air element the dead losses his hearing and feels surrounded by smoke. After the soul separates from the body, various levels of consciousness disappear and the deceased emerges into translucent light. This is when Tibetans believe that true death has occurred. Tibetan views about death are based on Buddhist belief in reincarnation. Tibetan people are not afraid of death. Death is viewed as a transformation not an end.Tibetans face death calmly because they believe death does not terminate a person's life, but indicates rebirth. 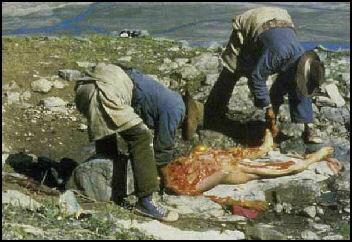 Tibetan are encouraged to witness death and the disposal of bodies so they do not fear death or are in awe of it. This is one reason why ritual objects are often made from human bones. After death, the body is kept in a sitting position for 24 hours while a lama recites passages from The Tibetan Book of the Dead to help guide the dead to the afterlife. Three days after death the deceased is blessed with morning prayers and taken to a monastery for the funeral. Tibetans believe that an individual’s souls remain in bar do, a special zone for the newly dead, for 49 days after death, during which time they enter a new body (that of a human, a hell being, a god, or an animal) to start a new cycle of life, death and rebirth. On each of the 49 days the deceased passes through a new level. After true death has occurred the dead begins his journey towards rebirth and this may involve communion with gods, demons, hungry ghosts or a trip to hell. All this occurs with the understanding that post-death experiences are not real, but projections of consciousness that causes birth, death and rebirth. The Tibetan Book of the Dead is believed to be loosely based on the 14th-century mortuary texts read at funerals. Newsweek described it as "the most popular faux Buddhist volume in English." Over the years it has been offered as proof of spiritual evolution, as a justification of the use of psychedelic drugs like LSD, and as empirical evidence of the "science of death." According to the book itself The Tibetan Book of the Dead was composed by an 8th-century lama named Padma Sambhava, who is perhaps a mythical figure. He is credited with predicting that Buddhism would be persecuted in the 9th century, which it was, and had the texts hidden in cave. The texts were reportedly found by the Tibetan scholar Karma Lingpa, who is credited with spreading and popularizing the them. The Tibetan Book of the Dead texts vary from place to place. They consist mainly of preparatory prayers, instructions on how navigate the complicated death process and exhortations to the deceased to be clearheaded and alert during the death process. The various prayers are addressed to a wide range of gurus, guides, and bodhisattvas that are supposed to provide assistance. Preparing the body for sky burial Greatly influenced by Tibetan Buddhism and Bon Religion, Tibetans have five ways of disposing of a dead bodies: 1) Sky Burial; 2) Water Burial; 3) Fire Burial (cremation); 4) Earth Burial; 5) and stupa burial (internment) or embalming. Corpses are still mummified using an ancient technique in which the corpse is but in a large box and packed in salt for about three months. Cliff burial and tree burial are also practiced occasionally. The funeral services must follow the rigid hierarchy of ranks, sharp demarcation, and also mainly depends on the divination from Lama. In the “water burial," the body is dumped in a lake or another body of water. Fish sometimes eat the bodies which partly explains why Tibetan don't eat fish. The "fire burial," or cremation, is a luxury only the rich can afford (firewood and fuel are expensive and in short supply in Tibet). The "earth burial" is practiced by Tibetans who have been assimilated into Han, or Chinese culture. Embalming and mummifying the body is a practice reserved for revered lamas. After the death of a lama, the lama's body is cremated and placed in a mound at the crossing of four highways to symbolize the "universal reign of his teachings.” At most funerals there are often few signs of outward grief for the attendants are often deeply religious and believe the soul has already departed. When expressing grief, some monks bang their heads against a wall until it is stained with blood. Tibetan burials are deeply influenced by Tibetan Buddhism. Beliefs about death, the ceremonies, rituals and practices are in accordance with the Tibetan Buddhism and influenced by Buddhist concepts such as transmigration or rebirth. For smooth transmigration, there should be no trace left of earthliness (this is one reason why Tibetans don’t like their picture taken, as a photo could remain behind after they die). The body is no exception and should be thoroughly disposed of—either eaten by fish and vultures or incinerated. Eminent monks are cremated in part because it is believed they do need to go through the procedures of rebirth like the commoners. Very high lamas such as the Dalai Lama and the Panchan Lama are feted to grand funerals and their remains are placed in a stupa. According to the Chinese government:“Tibet is vast in territory, and there are diversified ways of burial, such as celestial burial [sky burial], pagoda burial [stupa burial], cremation, water burial and burial in the ground. In the past, the selection of burial way is connected closely with everyone's economic and social status. 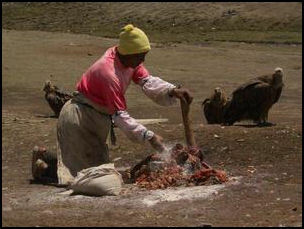 The most common form of burial in Tibet is sky burial, called Jator, meaning "feeding the birds." 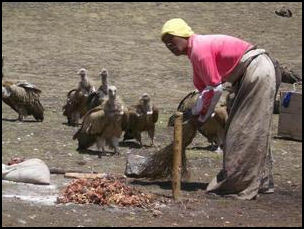 The bodies are taken to the Jator site in the mountains and fed to vultures. Cremation is considered less noble than stupa burial and is reserved for high monks and aristocrats. The corpse is seated on a stack of wood and straw poured with butter and burned. The ashes of the sainted monks are put in a wood box or an earthen jar and thus and buried in the earth at home or on the top of a hill or in a piece of pure land. Or the the ashes are taken to the top of a tall mountain and scattered with the wind or into the river. But the sainted Living Buddha or Lama's ashes usually is put into a small gold or silver tower some together with classical books, joss, musical instrument (used in Buddhist or Taoist mass), and treasures. The tower for worship is usually called mourning tower or mourning bone tower. "Sky burials” are the most common way of disposing of dead bodies in Tibet. A sky burial is simply the disposition of a corpse to be devoured by vultures. A monk or sky burial specialist eviscerates the human corpse, leaving the flesh as food for vultures and smashing the bones into a grainy dust. The process is supposed to liberate the spirit from the body for peaceful transport into the next life. In Tibetan Buddhism, it is believed that sky burial represents the wishes of the soul to ascend to the afterlife. It is the most common way for ordinary Tibetans to be taken care after they die. Sky burials also have a practical side. They make sense in a land where fuel is scarce and the earth is often too hard to dig. During a "sky burial”the body of the deceased is carried to a monastery on the backs of close friends and cut into little pieces by monks or members of a professional caste, and the pieces are fed to vultures who carry the spirit skyward to heaven. Family members of the deceased are often nearby but not actually at the site of the burial. When a body arrives the hair is cut off, the body is cut into pieces and the bones are pulverized and mixed with tsampa for the vultures to eat. Before stripping the flesh off the bones the monk who does the deed usually sharpens his knife on the sides or a rock, walks around a monument and says a prayer. Groups of cinereous vultures fly to fight and peck the food. It is the luckiest if the corpse is consumed totally by vultures, which means the dead have no sin and the soul has gone up the heaven safely. If there are some remains, they should be picked up and cremated, while lamas chant sutras. 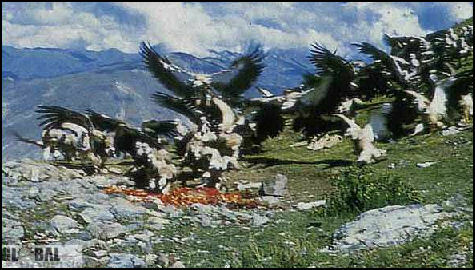 Sky burial are usually performed in places where wood is scarce and the climate is cold. 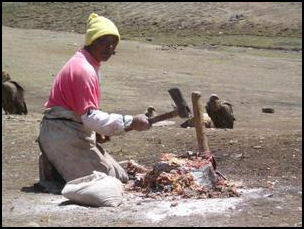 Tibetans can’t bury their dead because the ground is often frozen, nor can they burn them because there is little wood. The bones are collected and taken home and scattered. For important lamas the bones are mixed with mud and made into a chorten. Adding flour Communists officials banned sky burials in the 1960s and 70s. As part of tolerance for Tibetan customs and religious practices, sky burials were allowed again in the 1980s. The vice governor of Tibet told the New York Times in 1999, "We encourage cremation but we allow sky burial. It’s a Tibetan custom...Tibetans feel very strongly about sky burial. A few years ago, a Chinese soldier shot a vulture and was stoned by Tibetans. It was understandable. if vultures are fair game, who us going to do sky burial." In Lhasa sky burials are performed at dawn at special burial grounds, near a temple, that have been used for such burials for centuries. The rituals are closed to outsiders. In remote areas of Tibet the burials can sometimes be observed by outsiders. Participants of funerals regard ogling tourists as invasions of their privacy. Taking photographs is considered to be horrible manners. "Sang" (incense) smoke is first lit up to attract cinereous vultures, and the master of celestial burial dismemberments the corpse after the Lama finishes chanting. If the dead is a monk, a design with religious meaning should firstly be carved at the back of the dead. Then the master takes out the internal organs and throws them around. He smashes the bones and skull, and mixes them with Zanba. "He took one bone after another, placing them on a flat stone. Raising a small sledgehammer over his head, he smashed them into small pieces...so small they could be devoured by vultures...separating the yield into two small piles, flesh and bone...next to last came her skull, which burst into pieces with a sharp crack, when the hammer came down." "When Lobsang finished cutting the body, he looked up at the vultures on the hillside. He signaled them, with a flick of the wrist, that it was feeding time. On cue the birds descended in a mass of flapping wings and pecking beaks, devouring the remains in minutes...No trace of the woman's body remained...The vultures, about of 50 of them, ambled slowly up the hill and took to the air with evident difficulty, overfed as they are from the daily ritual." Lobsang told the New York Times he disposed of 10 to 15 bodies a week and was paid about $5 for each one. "I come here every day, and its about the same. Some bodies smell worse. Some are bigger, heavier. No big deal." Environmentalists say that sky burials are good for the environment because no wood is burned, no water is fouled and no space is used up. A British writer pointed out, "What better way for the body to be returned to earth than directly as vulture droppings?" Sometimes the bodies are eaten by wild dogs rather than vultures. In a National Geographic article, Chinese scholar Wong How-Man described a monk who couldn't get vultures to come to his "sky burials" so he hired a man who knew how to attract the birds with a special whistle. 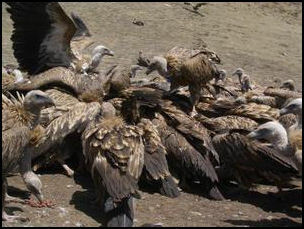 Vultures have been driven away from sky burial sites in Lhasa by all the development.